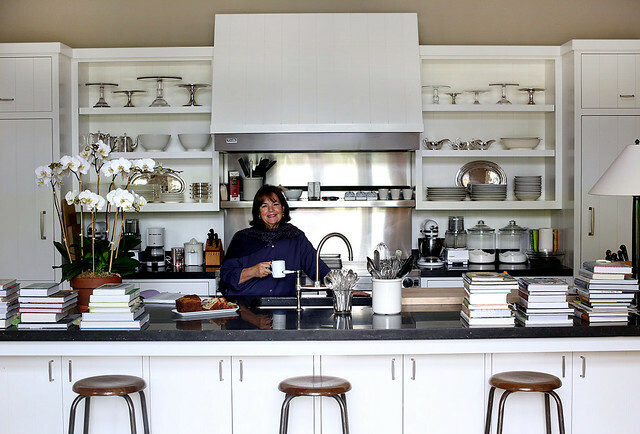 Ina Garten as her alter ego, the Barefoot Contessa, toils away in her ostensibly glorious East Hampton kitchen. It's a room which appears on television and in print to walk the fine line between a casual cook's ultra functional aesthetic daydream and a professional chef's demo kitchen straight from a Nancy Meyers movie set. It's a cold December day. Flurries fall from the sky and softly land atop the partially snow covered wind swept ground while Ina's weathered gray cedar shingle style home glows in the new morning light. Though it may be calm and cool outdoors, Ina's kitchen is warm and a flurry of activity. After all, she's got a dinner party planned for later in the evening and has only herself and a hodgepodge of helpful friends to pull it together. Can she do it? Of course she can, she's the Barefoot Contessa. 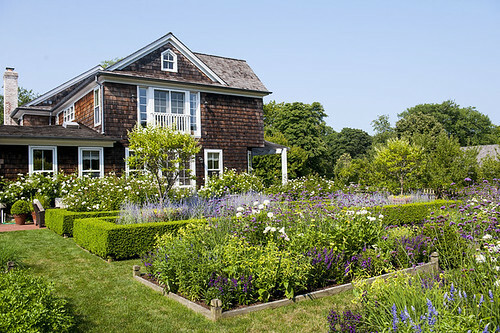 Our row house is far from a sprawling ocean-side cottage tucked among the luxe east end of Long Island, but there's no reason why we can't aspire to throw ourselves a little shindig that permits us to channel the best of Ina. 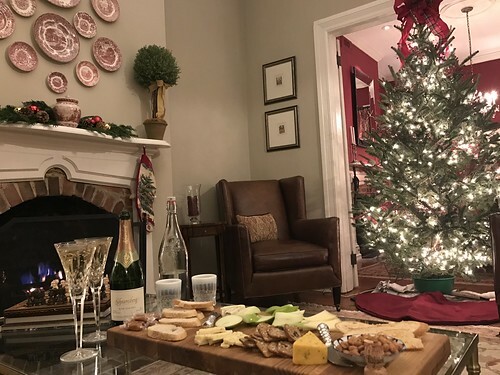 In fact, we decided to plan and execute a little neighborhood holiday dinner party to experience first hand the exhausting level of effort necessary to scratch the surface of an Ina Garten inspired event. Today, as an active observer, participant, and fan of my spouse's vast array of abilities, I'd like to share my experience surrounding this event. It's my hope you might be able to get some ideas from our party that you might be able to apply if you want to throw one of your own. Earlier this week Wendy shared how she pulled the tablescape and centerpiece together to set the main stage for this dinner. However, the lens of her content was limited when it came to the behind the scenes prep that took us from planning to party. As you're likely well aware, all too often when it comes to blogs, Pinterest, or television shows we all get to see the seemingly effortless execution and near perfect end result of wonderfully pulled together projects or events. But reality is far from the simplicity we all like to believe. After all, this simple fact is what has given birth to the wonders of the #PinterestFail. But back to our dinner party. Truth be told, Wendy has a knack for planning, preparation, and execution when it comes to complex events. In fact, it goes well beyond a knack...it's a honed skill that impresses me every time I have an opportunity to bear witness. But one skill Wendy possesses that I completely lack an aptitude for is an understanding of how to accept help when help is offered. 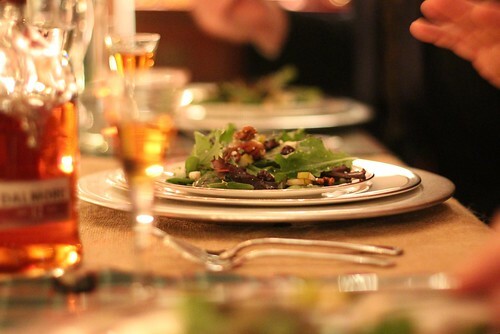 In this case, rather than trying to handle the entire meal ourselves, each set of guests was set to bring a course for the meal along with a whiskey to pair with their course. 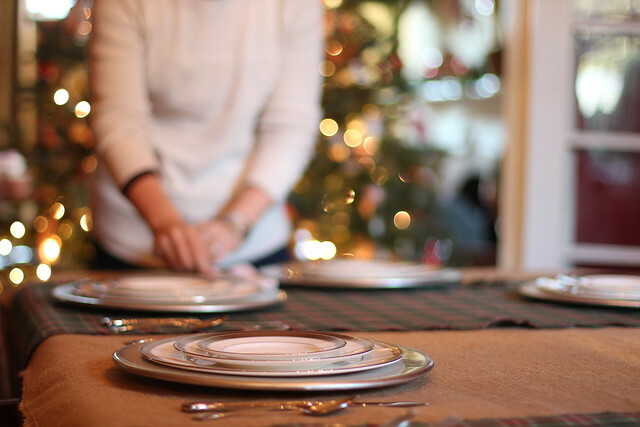 This meant we'd be able to focus on decorating the house, setting up the dinning room and side board, and preparing the main course, while others handled the starter, salad, and dessert. As a longtime fan of Ina's work, Wendy has studied hour upon hour of her shows. She studies the concepts behind her recipes, immerses herself in the myth of the prep, attempts to ignore the obvious wrinkle that it's TV with a crew, not just Ina at work alone, marvels at her ability to pull it all together, and at the same time scoffs at what seems to be an egregious amount of oil, butter, and salt that often find their way into the recipes. As a longtime partner to my Ina-obsessed spouse, I often find myself watching along while gently poking fun at the contrived for basic cable premise of it all (all the while understanding just how much I benefit from Wendy's fandom). 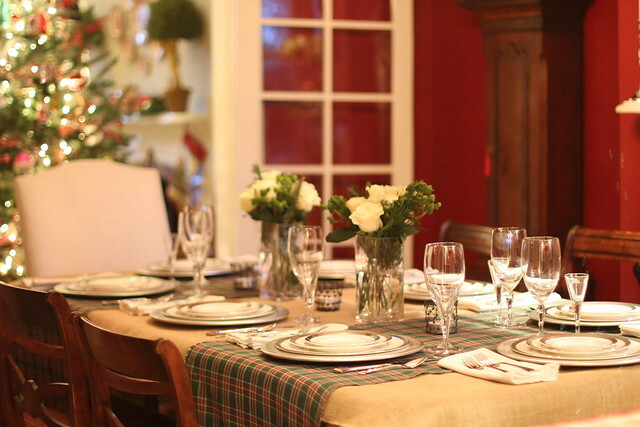 Our dinner party was our latest opportunity for Wendy to put the skills she's learned from the Food Network to test, and for me to enjoy the show as an active participant and co-host. So let's get down to brass tacks and discuss how we got this party started with the choice of a theme! While Ina often uses the celebration of a specific friend or guest's arrival (or our favorite, Jeffrey is coming home from the city), it was our goal to focus our celebration on the Christmas season coupled with Alexandria's Scottish Heritage. After all, earlier in the morning on the same day as our party Alexandria was celebrating the very same thing with the 75th annual Scottish Christmas Walk Parade. 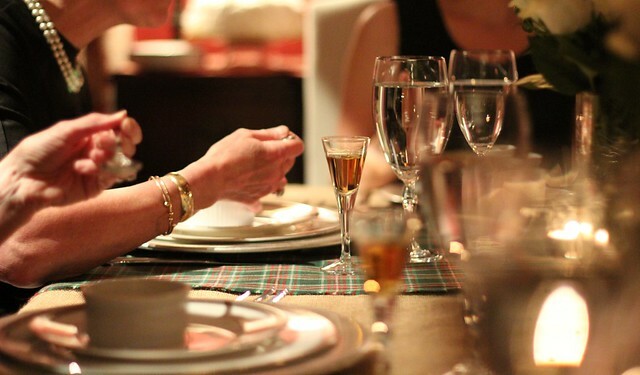 The town was already in a very Scottish Christmas mood, so we decided to call our celebration a Christmas Whisky tasting and dinner. 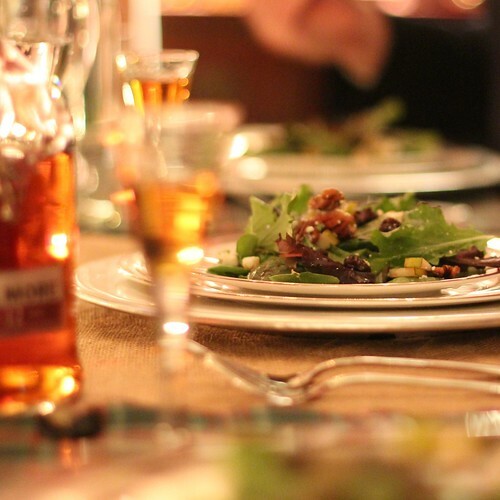 The goal of our party was to bring a few neighborhood friends together, eat some very delicious food, and sample a wide variety of whisky along the way. But when it comes down to it, you really don't need anything more than a good excuse to throw a party, and pretty much anything works. 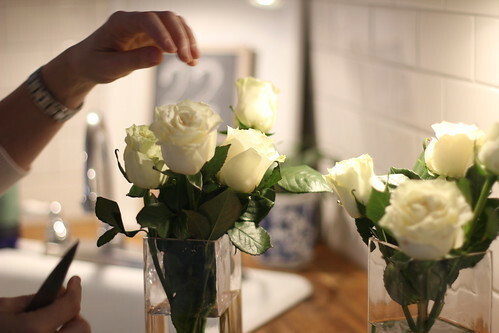 Maybe your florist friend Michael wants to drop by to decorate your home? Might as well throw a orange tulip themed party. 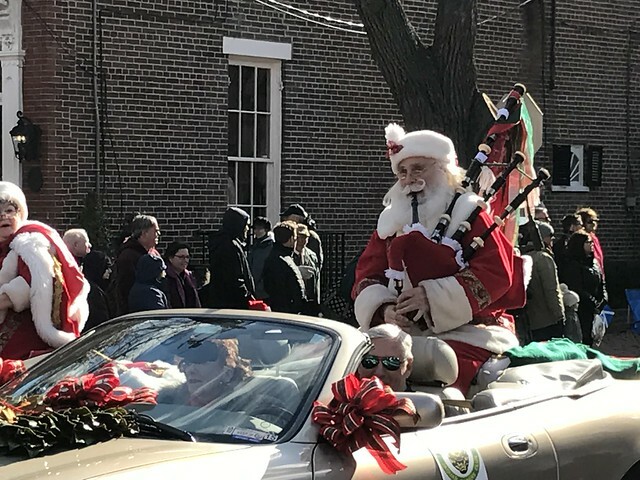 Maybe in our case, one or more of our party attendees happen to be mildly obsessed with Outlander, several attendees happened to have kilts, and our city is celebrating Scottish heritage with a Christmas parade, so we might as well throw a Scottish inspired Christmas party. 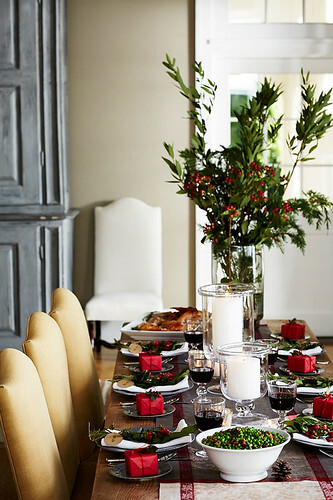 No matter the excuse, extend it as a theme and you'll be able to tie your whole dinner party together off of this one common thread. You might have to get a little creative, but the creativity is ultimately what makes it fun. To properly embrace the extent to which Ina ensures her guests' sensory experience is properly guided, she doesn't just rely on her palette pleasing Cirque Du Soleil of drinks and dishes, but also executes in presentation that extends to far more than the prep of a delicious meal. 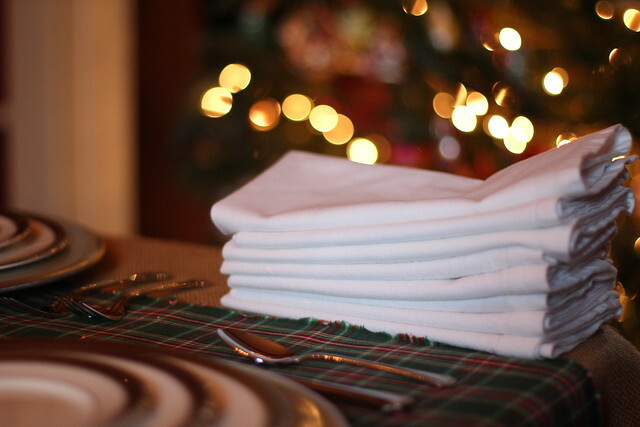 The mood set by the location, table decor, place settings, and other embellishments associated with the event, which it is almost as important to the overall execution as the meal. For this reason you often see Ina out and about the day before or day of a party, shopping for that perfect bouquet of flowers or that ideal artisanal bread to augment the whimsically rustic look of the table. Since our dinner's Theme as a Scottish inspired whisky tasting event was to revolve around the Christmas holiday, all the while embracing the feeling of the blustery and rugged Scottish highlands, the decor of our home and dining room had to reflect this feeling. Wendy went into great detail on how we pulled off this complex look of tartan covered rustic sophistication on a budget, but the reality wasn't as simple as throwing up a Christmas tree, placing some flowers in water, and tossing our tablecloth on the dining room table. Oh no, the effort is full of trial and error with lots of questions of "does this look good to you?" 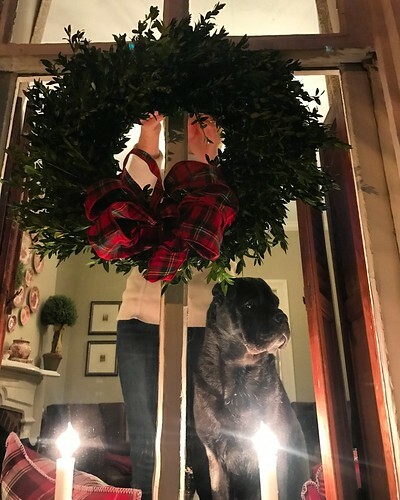 It all started a two days before our party when one or the other of us loudly exclaimed, "We're throwing a party in two days and we don't have a damn bit of Christmas decorations up in the house!" I believe the other's constructive retort went a little something like, "So should we go buy a tree?" 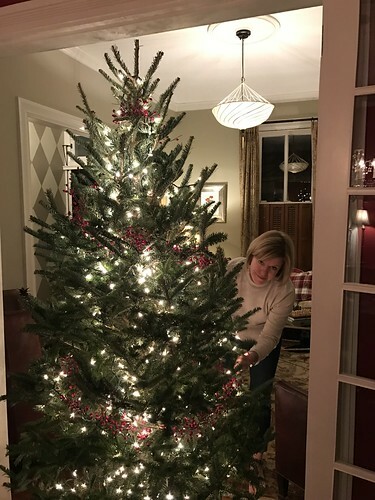 In the life of the Barefoot Contessa, a bevy of stage hands and production assistants have likely already selected the perfect garland, had a tree shipped in from Vermont, and were madly turning her dwelling into a festive holiday abode. 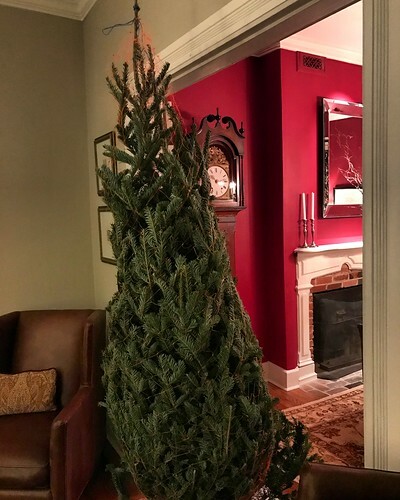 In our home we selected an questionably symmetrical tree of roughly the height we'd need, with as few dead needles and bald spots as we could bear, and we stood it up on the stand. Yes, you're right, your eyes do not deceive you, the tree was leaning farther than the tower of Pisa. But a teetering tree is far from a little speed bump worthy of derailing our plans. Rather than worry, we broke out the decorations, lights, ornaments, bubbly, and cheese and we made an evening of plumbing up the tree and covering it, and our home, in ornaments and decor. I'm serious about the bubbly and cheese. We're doing as Ina does, and anything worth doing, is worth doing with snacks. 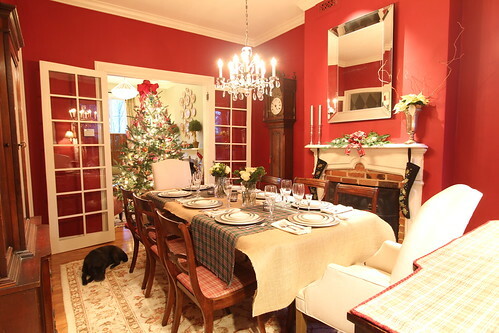 When it came time to set up for the party, we did have to slide the tree about four feet into the other room in order to make room at our dining table for the people we were inviting to our party. It seems that once we place the leaf in our table, our tiny little house is not able to easily accommodate a table set for eight, our dining room furniture, and a large wonky Christmas tree. If I had to guess, I bet Ina doesn't have these sorts of problems. 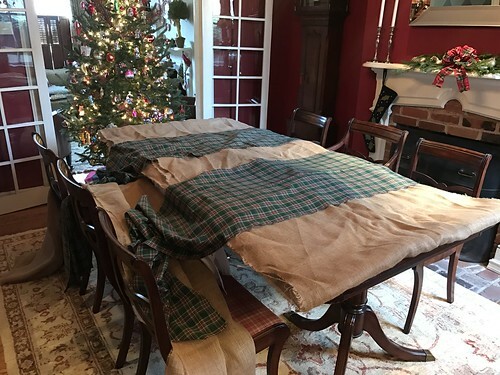 When it came to dressing up our expanded table, we couldn't leave any wood exposed. 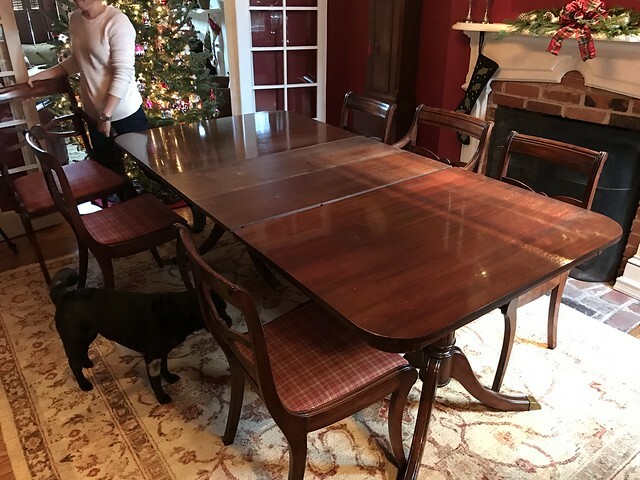 Our table is a vintage piece we picked up from a Cleveland antique store about 13 years ago. The table top of the main table has been refinished, but the tables leaves are very much...unrefinished. The end result of our table covering was burlap and tartan, and it looked rather lovely. But this wasn't achieved without contemplative iterations. 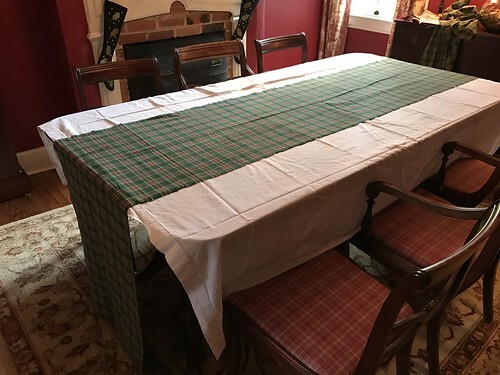 First we tried a white linen covering that was too small for the table with a tartan runner that was too large. That apparently didn't work. 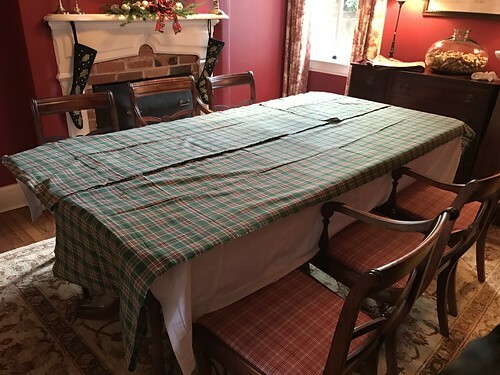 Then we tried the idea of tartan over the whole table using two runners of different length. That too had its faults. At this point, much to the delight of Lulu and Mel, who love laying on the burlap, we landed on the preferred approach. 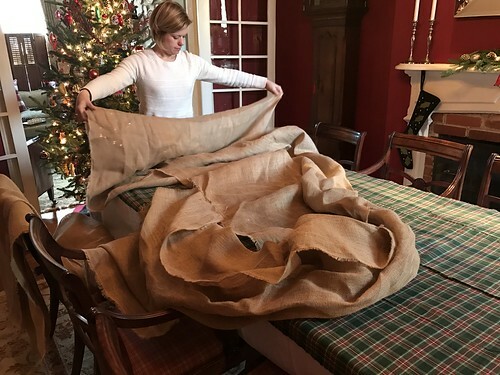 A burlap base with horizontal runners. This equation of fabrics proved successful in concept, but possessed an excessive number of wrinkles. 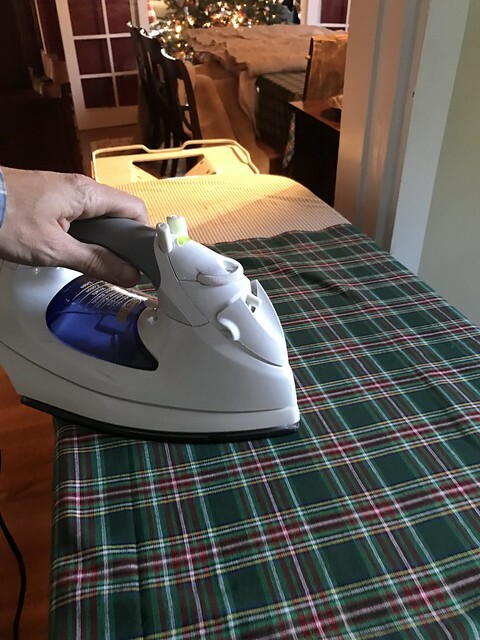 While Wendy went to shop for the needed ingredients, I was dispatched as linen ironer to resolve the issues of the wrinkled table cloth as well as the equally creased white linen napkins. The table itself begins to come together as layers of various weights and textures of tableware. Some items with a purpose within the meal, some purely decorative, all 100% and completely useful in the overall aesthetic. By the time our table was completely set, the sun had done the same, which only made us feel more pressure to get things into gear so we'd be ready when our guests arrived. But at the very least, our table had the look we were going for to set the scene for our event. How great is that? It does make me wonder how many people sit in a room when blocking out an episode of the Barefoot Contessa to determine just how things will look when guests arrive, or if Ina just takes the bull by the horns and makes all of the decisions herself and everyone else executes based on her direction. Regardless, if there's one thing I've learned as a modern 21st century spouse of an entertaining maven, it's the absolute importance of nicely ironed and folder white linens napkins to set the mood for dinner. In Ina's world, her husband, Jeffrey, is often both the guest of honor at the party, and nowhere to be found in the home for prep. Occasionally you'll get a quick shot of him reading the Financial Times while on his way to the Hamptons from his busy job in the city. Meanwhile, Ina is able to fully coordinate a multi course meal all on her own. From watching the show, all I can say is "it's good to be Jeffrey!" In the execution of Ina's parties I often wonder who else is helping? Just watching everything being taken out to the tables is overwhelming when considering one person may be doing the planning, prep, and cleanup. Our party, as I mentioned earlier, was made far more manageable by the simple fact that each set of guests had volunteered to bringing a dish and a whisky. This way we would each be able to focus on a single delicious course, rather than trying to coordinate and prepare four separate courses. Taking on more than you're capable of is a classic recipe for a dinner party disaster. I know my eyes are usually bigger than my stomach when it comes to what I would choose as a menu. The fault in my approach is that I don't think of the complexity of what we'd be preparing, only the enjoyment of eating. The end result of such a plan would be a lot of bored guests waiting for food that I'd be frantically preparing, and me serving everything either cold or overcooked. But Wendy knows better than me (way, way better). She began planning the main course as a three part dish that we could prepare ahead of time and would be able to simply stick in the oven to bake 20 - 30 minutes before it was needed. For our main dish Wendy decided on Ina's garlic & herb roasted shrimp (from her book: " Make It Ahead: A Barefoot Contessa Cookbook ") with sides of her goat cheese mashed potatoes and roasted broccolini. Wendy chose Ina recipes for both the shrimp dish and the mashed potatoes because, well, Ina has never steered us wrong. It seems like pretty much any recipe we've ever made of hers has been delicious. 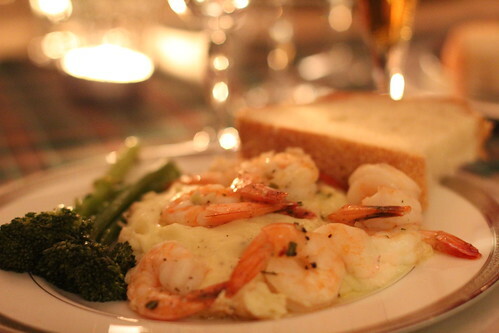 The beauty of this planning is in the ability to pre-make the shrimp and set it aside while moving onto the mashed potatoes. 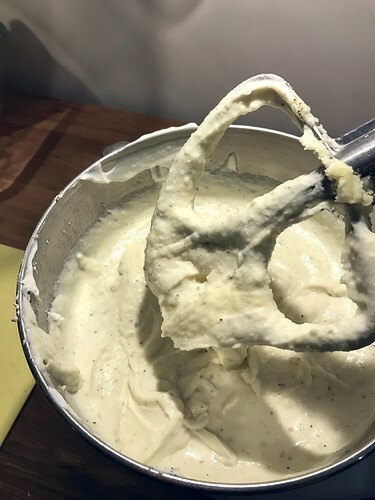 But the difficulty of making the mashed potatoes is struggle while making it to keep yourself from eating all of it straight from the bowl while taste testing. I'm not even kidding, these potatoes are delicious! The final piece to the main course was the ultra simple roasted broccolini. 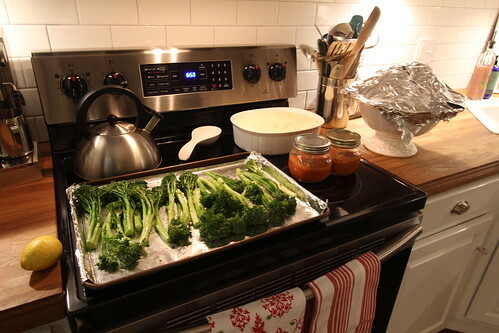 Just toss the broccoli with a little olive oil, salt, and pepper, and roast it in the oven. How easy is that? 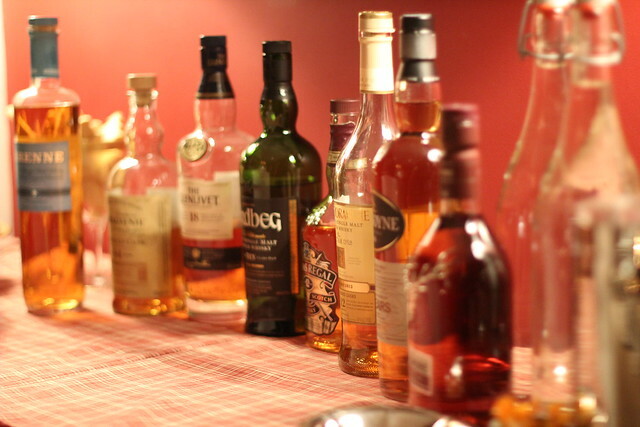 Before we get into the rest of the food, let's talk a little about the whisky lineup we assembled for this party. We dusted off our various bottles from our liquor cabinet, and the guests each brought a favorite bottle of their own. The end result was a wide array of whisky flavor personalities. The mix consisted largely of Scottish single malts, but we even had a delicious French whisky to try. The key here was to have an understanding of which whisky was softer, and which was a bit more aggressive or smoky on taste, so that we could pair their tasting with the food we'd be eating. And what I mean by that, as a bunch of whisky novices, we pretty much read the bottle labels and did a little Googling to figure out what went where. We also had a small dish of candied ginger on hand. If you're doing a whisky tasting, and there are people at your table that don't particularly enjoy particularly smoky or heavily peated Scotch, chewing on a piece of candied ginger will balance the flavors. Like pairing food with wine, the flavor balance of the ginger will turn a harsh tasting whisky into something many people will really enjoy. We began the meal with a small starter course Wendy put together much earlier in the day. She filled several tall shot glasses with some really good homemade warm roasted red pepper soup. Serving soup shooters pre-meal is one of those very quick things you can do that will really fancy up a meal. We paired a starter shot of Thistly Cross cider with these red pepper shooters. Thistly Cross is a cider that we came to truly enjoy in Scotland, and they have a flavor that's finished in whisky casks. As a result, you have a tasty cider with a hint of whisky. This can be a great option for those at the table that aren't necessarily whisky fans and prefer something a little sweeter. The couple who brought the first course chose an amazing combination of three seafood items. 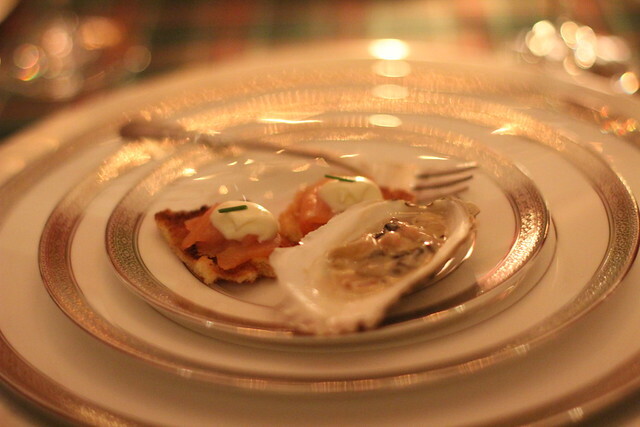 The first two were a baked oyster served on the half shelf paired with a small piece of salmon atop a lightly toasted quarter of brioche bread, topped with a bit of crème fraîche and a chive. The baked oyster tasted almost like a single delicious bite of oyster chowder. And the presentation of the starter was very nice given that it was served on the shell, but this is another easy thing you can do to add some interest if you're serving baked oysters. The shells are completely reusable, you just need to find a handful of oyster shells that are large enough and have the look you want. Once you use them you can wash and dry them like any other dish, then put them away for the next time you want to use it. How easy is that?! 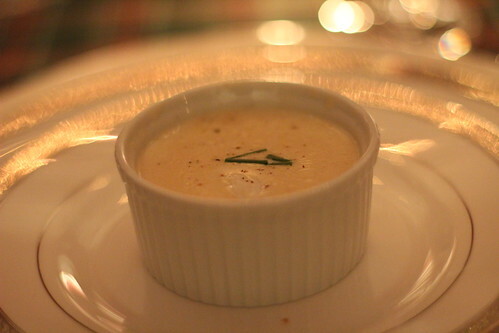 A starter of crab bisque was also served as a secondary starter dish, and it too was delicious. All of these starters were paired with a very soft French whisky that had been made in sherry casks. 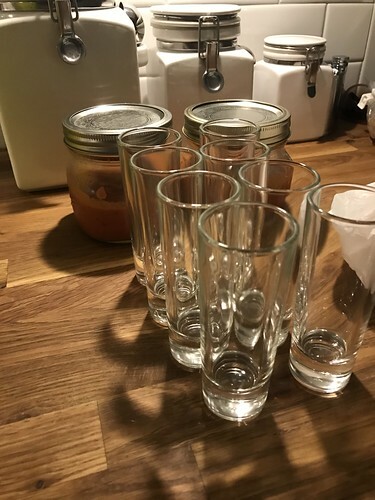 In order to taste the whisky we placed small tasting glasses at each place setting which would allow sufficient tastes of each pour without the tendency to pour too much into larger glasses. The salad course represented a refreshing and wonderfully prepared dish. I personally love a good salad, and this hit all of the marks perfectly. The salad consisted of mixed greens, diced pears, and gorgonzola cheese. It was topped with homemade candied walnuts and dressed with a homemade aged balsamic vinaigrette. All of the balances between the sweet and acidic elements were perfect and I could honestly eat this salad at pretty much every meal and always be happy. With the salad course we paired The Dalmore 12 year whisky, which is aged in several different casks, including bourbon and sherry. Again, this is a much softer whisky that tends to be a crowd pleaser. The beauty of this pairing was also how well it worked with the tastes of the salad. While we went into detail on what ultimately made up the main course above, the finished presentation was colorful, balanced, and very tasty. The overall dish was complemented by a large slice of crusty pugliese bread perfect for gathering up any of the remaining mashed potatoes your fork isn't able to retrieve. While some of the whiskies were delightful to try, the reaction to others, especially those of the heavily peated variety were, um, more unexpected than others. For the main course we paired several different bottles of Scotch, but all were getting slightly more smokey and peated. 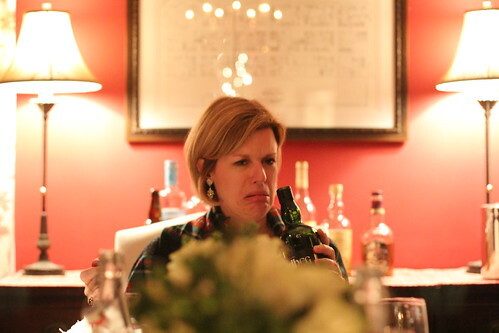 As I mentioned before, pairing the candied ginger certainly helps reduce the number of times you see this face while doing a whisky tasting. 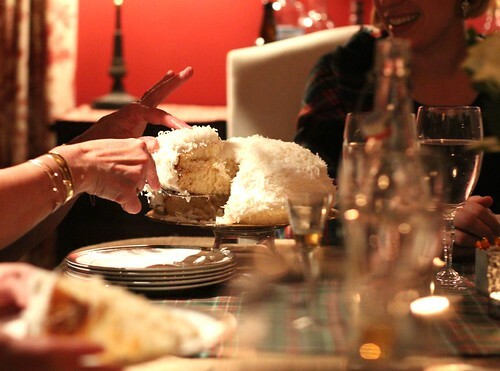 For dessert one of the guests brought her famous coconut cake and a bottle of their absolute favorite Scotch that they discovered on a 100 mile backpacking trip in the highlands of Scotland. As part of our themed whisky tasting party, each person was also responsible for telling the group a little bit about each whisky we were tasting. In this case, the story about the Glengoyne whisky and distillery allowed the tellers to not only provide information about the taste, but to also share some of what made their vacation particularly amazing. From start to finish the menu of our Ina inspired dinner party was equal parts delicious, elegant, beautiful, and enjoyable. And even though we were only cooking the main dish ourselves, it was a substantial amount of effort. I simply can't imagine trying to handle the prep of everything for an entire dinner party and trying to enjoy the meal at the same time. When watching the Barefoot Contessa, you may be be watching for the food, but ultimately you're going to see the fun. Whether it's welcoming Jeffrey back from the city after he's likely subsisted the final two days of his Manhattan seclusion huddled over whisky and snack sized bags of Cheetos, or celebrating the arrival of some of her friends who are in town for a few days, Ina's parties are full of happy and hungry people. For our party the decorations were festive, the theme inspiring, and the meal was delicious, but the star of the party was getting to spend a few hours with great friends and neighbors to celebrate the occasion. When life is full of projects and work it's a little too easy to forget just why you're working quite so hard. Ultimately, a little time spent chatting over some beautifully prepared food is a great reminder that the effort is only worth it if you take some time to enjoy. We hope our guests had a good time, and we know we had a wonderful time hosting the party. I think it's at least somewhat evident that by the end of the night there was conversation going on planning out who would be hosting the next gathering. It is clear to me why the Barefoot Contessa is such a successful and long running show. 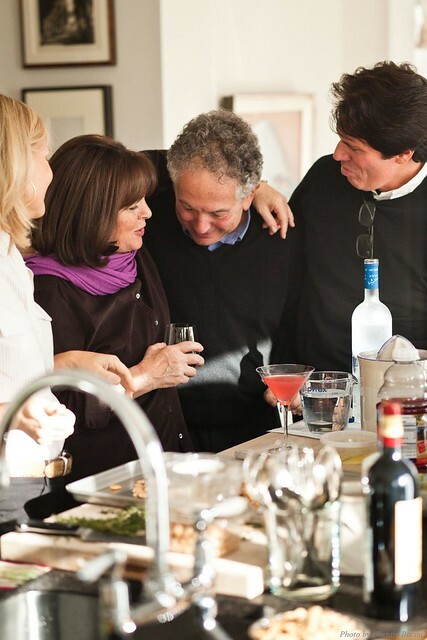 There may be plenty to poke fun at, but ultimately Ina Garten is planning, preparing, and throwing parties that bring people together and allow them to have a wonderful time with each other. Another thing we can tell you for absolutely sure. It's probably pretty exhausting being Ina Garten. While her shows may have a lot of help from a vast staff that works on it with her, Ina was able to create this show due to years of executing similar parties on her own. We had, and we believe our guests had, an absolutely wonderful time celebrating Alexandria's heritage, enjoying some delicious food, reveling in the company and conversation of friends, and sipping a wide variety of whisky. 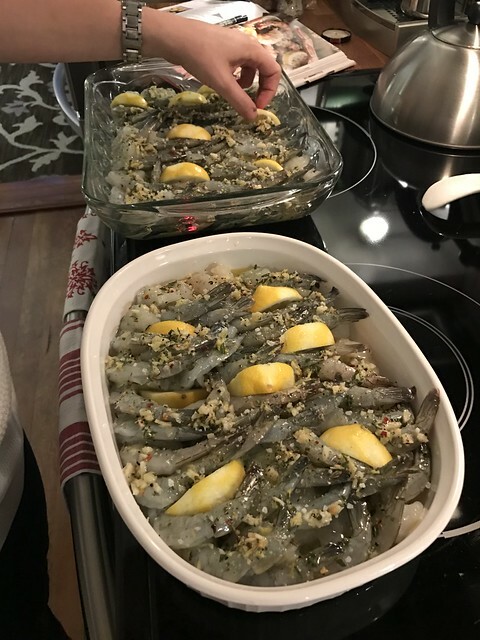 While trying to throw a Barefoot Contessa style party may involve a whole lot more than meets the eye when you're comparing it to what you're watching on her show, it's absolutely a lot of fun and something worth doing with friends (especially when they offer to bring some of the dishes). But if there's one thing that makes this recipe complete, it's the addition of a whole lot of fun and enjoyment that can be had by all involved. You'll all be able to raise a glass and exclaim, "How easy is that!!" Great to see some behind the scenes but that looks so exhausting! And predictably, now I'm hungry. And thirsty. Definitely thirsty. This party looked like a lot of fun -- most of all, though, I enjoyed Alex's commentary on the TV show. Well done! I'm a huge fan of hers myself, so I am assuming all of the ingredients used in your dishes were "really good". My husband is a firm believer that Jeffrey is spending the week at Yale with his hot young students, because, well, my husband is a pig. HAHA! This is easily the best comment of 2016! Every time I walked into the kitchen while Wendy was making stuff I kept asking if it was time for the "really good vanilla" yet. Personally, I think Ina sends Jeffrey off each week with a chuckle, a smile, a slight wave, and a neat little stack of artisanal sandwiches wrapped in brown paper with cute little twine bows. But she only packs enough to get him through 3 days, and by the end of each week I picture him subsisting on whisky and snack sized bags of Cheetos. When it comes time to return to Ina's kitchen, all he can think about is that mouth watering roast chicken she likes to have waiting for him...Jeffrey's favorite! Amazing behind the scenes. Those food pics made me hungry..!! I think that's half the fun of any food centric blog post. Warning! 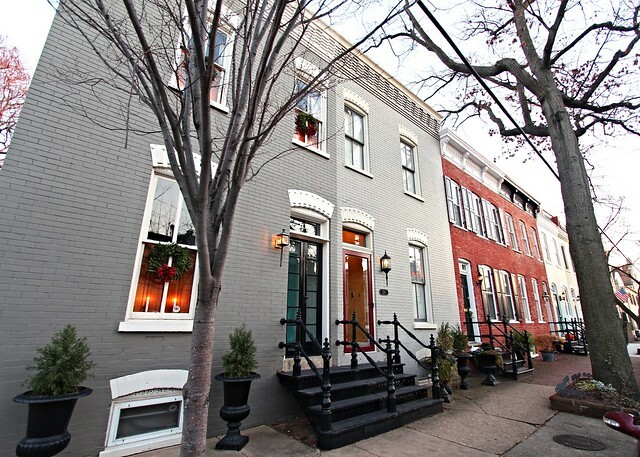 Your townhome is getting smaller and smaller. Yes, especially at Christmas and when full of people.